View More In Fruit & Nuts Gifts. They say that anything is better by the dozen and that's particularly true this holiday season. Just look at this sensational tower of goodies - three types of pears, three kinds of apples, smoked wild Alaska sockeye salmon, blueberry yogurt pretzels, zebra chocolate popcorn - 18 treats in all. Better still, don't just look at it - indulge. If you've been especially good, your gift recipient may invite you to share! *Delivery is available to Alaska and Hawaii. An additional Shipping and Handling fee will apply to shipments going to Alaska or Hawaii. This fee will be quoted at checkout. Additional transit time may be required. Delivery is not available to Puerto Rico. 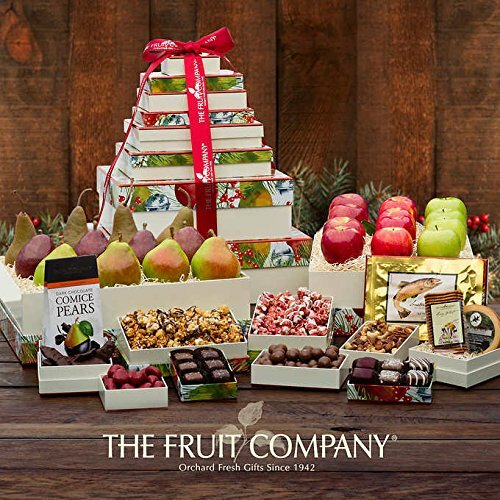 Tower dimensions: 15.5" x 13" x 19"
If you have any questions about this product by The Fruit Company, contact us by completing and submitting the form below. If you are looking for a specif part number, please include it with your message.